An ideal food storage space, a cool room or freezer is one that’s perfectly cooled and protected from bacterial growths, because the contents of this room are hygiene-sensitive. Additionally, temperature changes and unsanitary labour practices promote bacterial contamination, which simply cannot be allowed. 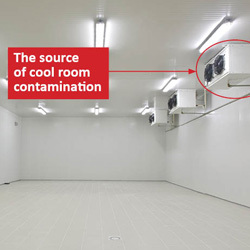 Cool room sanitation practices work in tandem with engineering principles to eliminate these threats, with the engineering side addressing temperature management issues while hygiene concerns are overseen by their own set of innovative solutions. Technology plays a major role here, with special germ inhibiting aids siding with the aforementioned engineering methodologies in use in cool room layouts. Special coatings are incorporated as part of the structural design. The insulating panels and steel supports are painted in advanced formulations, chemical agents that kill germs, harmful or otherwise. The sustainability of this scenario presents big challenges, especially since the cold temperatures and icy domain do not favour standard alloys. The answer is to design the structure with proprietary metals. Zinc-coated steel and exactingly finished substrates deal with the cold. The intelligently sourced metal components won’t crack or corrode, won’t surrender to icy streams of water, and will never present an opportune weak spot for germs to grow and flourish. Technological aids pair with the structure of the cool room to double the sanitation-resolving component. For example, when moisture permeates the insulating panels, a galvanic response would be triggered, an event that leads to corrosion and structural deterioration. Fortunately, engineering prowess copes admirably with this threat by ensuring non-catalysing metals are present. The metal surfaces remain intact and the secondary corrosion-resisting properties of the anti-microbial coating reinforce this material property. The result is a polished metal framework and a series of top-of-their-class insulating panels that are designed for upper-end hygiene purposes. The polished finish of the alloy even enhances cleaning programs by delivering a smooth surface, one that can’t be damaged by harsh chemical cleaners. The smooth surface finish of smartly sourced cool room materials is designed to prevent bacterial colonies from gaining any purchase whatsoever. Next on the substrate coating ladder, this subsurface profile is armoured by adding anti-bacterial paint, a coating that magnifies a cool room sanitation strategy, pushing the design into a realm where it can be classified as the ultimate sustainable germ fighter, one that satisfies every independent laboratory test and hygiene-related governmental regulation.